People who know me always "pooh-pooh" my griping about the weight I've gained since moving south. Yes, I've always been skinny. Yes, my ankles and wrists are still ridiculously thin. But folks, let me assure you that even if a person is thin/small/weighs under 125, if they add two inches to their waistline, their clothes will no longer fit. They will, in fact, get a "muffin top" over their so-tight-they-can't-breathe trousers. They will worry that injury will occur when the button from their pants flies like a projectile toward someone they love. And they will be depressed when they knit a sweater for themselves in a size that USED to fit. I was able to keep my midsection under relative control when I worked out every day. My last workout was only, uh...about a year ago. I keep deluding myself that I'll get back into the habit soon. Yeah... Until then, I finally bit the bullet last night and bought a pair of trousers for work that I will not have to lay on the bed to get fastened. I am elated. But not really. In the meantime, I will just not fasten my sweater. 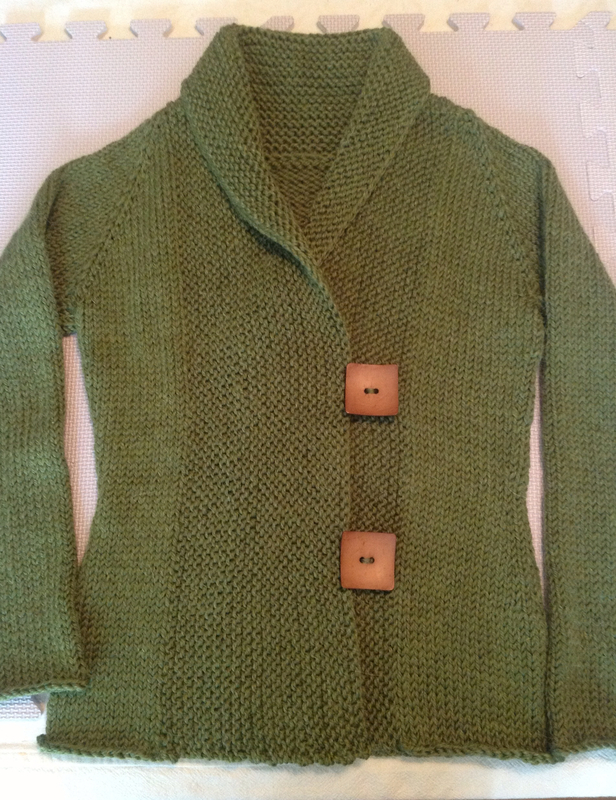 In fact, I may remove the buttons altogether. Either way, it looks perfect from the back. is this the same pattern as the one you made me last year? i love mine...and sometimes i have the same problem with the buttons...although i'm sure mine is 3 sizes bigger than yours!